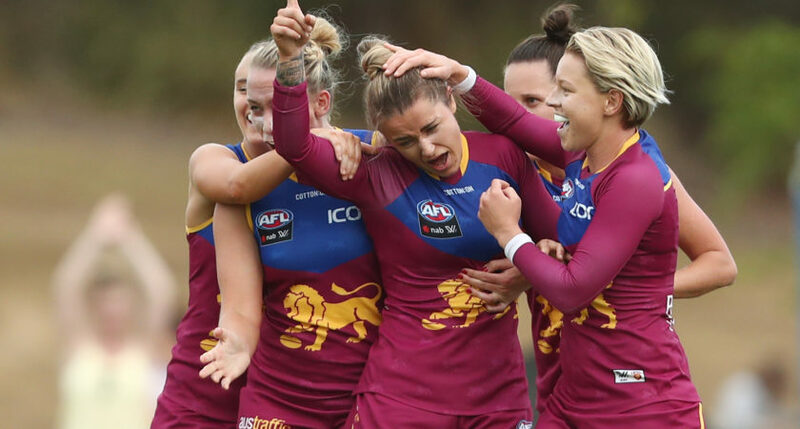 The Brisbane Lions’ road to a maiden 2019 AFL Women’s premiership got off to a positive start on Sunday evening, with the home side withstanding a competitive Greater Western Sydney outfit by two-points at Moreton Bay Central Sports Complex. For the third consecutive season, Brisbane claimed the four points in Round 1 with a hard fought 4.5 (29) to 4.3 (27) win over the GIANTS in front of a sizeable crowd. Brisbane spearhead Jess Wuetschner became the biggest beneficiary inside 50 as the home side dominated Inside 50s 30-23. Wuetschner booted a game-high three goals in the win and proved a mismatch when the ball hit the ground at the goal face; finishing with nine disposals. With the margin never exceeding much more than a single kick, it wasn’t until Wuetschner go-ahead major in the third term than laid the foundations for the Lions’ eventual win. Her third term major was one of three for the Lions in the vital premiership quarter, who fought back after booting just one in the opening half. Speaking following the tight win, Lions’ head coach Craig Starcevich praised his side’s ability to fight back in the second half. “We fought back well. We were down and out at half time and fought back to put ourselves right back into the contest in the third quarter which is really pleasing,” Starcevich said. Wuestchner’s heroics in front of goal were coupled with Sabrina Frederick-Truab who compiled another gutsy performance. The marquee finished with 16 disposals – the most by a Lion not playing in the midfield, seven inside 50s, five marks and a goal. Brisbane’s starting midfield trio all served the Lions well through the middle with Ally Anderson, Emily Bates (both 21 disposals) and Nat Exon (14 and four tackles) all found plenty of the ball. For the GIANTS, Irish duo Cora Staunton and Yvonne Bonner – who were both among the side’s best a fortnight ago against Brisbane in the practice game, were again busy. The pair kicked two and one goal respectively, including the first of the game following a free kick early in the game. Former U18 AFLW All Australian captain looked no part the 18-year-old through the middle, finding 17 disposals in her orange and charcoal debut while born again midfielder Rebecca Beeson was also busy with a team-high 18. The GIANTS won many of the key statistical areas throughout the game including contested possessions 115 to 88, uncontested possessions 104 to 94 and clearances 30 to 21 but couldn’t translate their midfield dominance any further. “We are our own worst enemies a little bit. When you win contested ball; when you win uncontested ball; you win clearances convincingly but to only go inside 50 23 times is hard,” GIANTS head coach Alan McConnell said following the loss. Brisbane now sit atop Conference B on the AFLW ladder and will face Fremantle away next weekend.